Since its inception, the minimum wage has provoked fiery debate. Indeed, when the Fair Labor Standards Act (FLSA) set the first federal minimum wage at $0.25 in 1938, the National Association of Manufacturers deemed it “a step in the direction of communism, Bolshevism, fascism, and Nazism.” Today, it remains a politically divisive issue. While many Democrats, including President Barack Obama, are calling for an increase at the federal level, numerous Republicans, including centrists in the party, would abolish it altogether. Amid political stalemate, low-wage workers have been galvanized into action, as seen by recent strikes across the country, from Macy’s to McDonald’s. This split in wage tiers was established in 1966, when Congress amended the FLSA to allow for a sub-minimum wage for tipped workers. While sub-minimum wage levels for students, youth and workers in training have long been allowed as temporary, the 1966 law made the “tipped wage” permanent through its “tip credit” provision. At that time, employers of tipped workers were allowed to pay a base wage of only half of the regular minimum wage, with the other half provided through customer tips, which is considered “credit” toward the employee’s total wage. This framework is legal as long as the sum of the tip wage and customer tips amounts to the regular minimum wage. In short, customer tips are not wholly a gift or token of gratitude from the served to the server but a wage subsidy provided to employers. In 1966, employers and customers shared equally in contributing to the wages of tipped workers. As the law intended, the tipped wage paid by the employer and the tipped credit from the customer were each half of the regular minimum wage. Over the next three decades, the official tip credit provision sometimes dropped as low as 40%, and never exceeded 50% of the regular minimum wage. As the situation stands today, at the federal level, the maximum tip credit allowance is $5.12, which is equal to the minimum wage ($7.25) minus the tipped wage ($2.13). The $2.13 tipped wage is now just 29% of the regular minimum wage, while the tip credit afforded to employers makes up 71%. What happened? 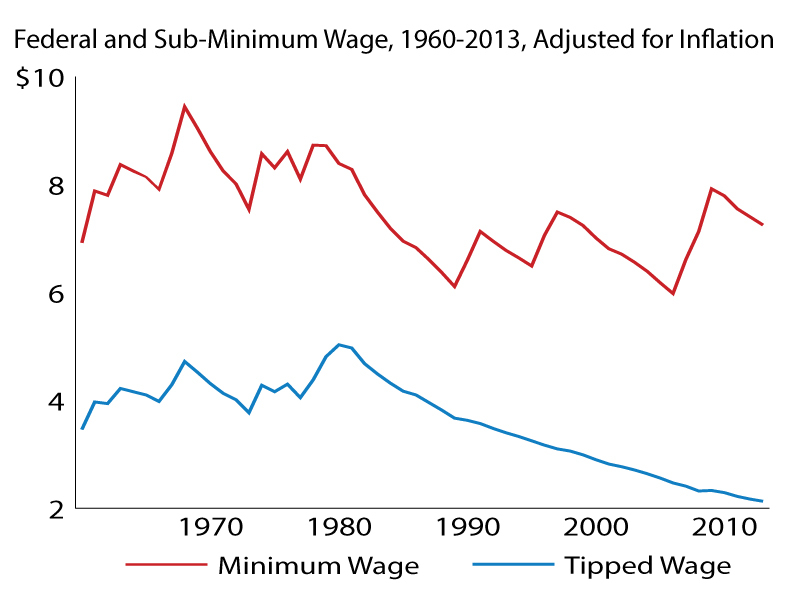 Ironically, it was the Minimum Wage Increase Act of 1996 that initially caused this relative drop in the tipped wage. Signed into law by President Bill Clinton, the act increased the federal minimum wage from $4.25 to $4.75 an hour but froze the tipped minimum wage at $2.13 an hour under heavy pressure from the restaurant lobby. At the time, the $2.13 tipped wage had been in effect since 1991. This means that the sub-wage floor we have today has actually been in effect for 22 years. And when lawmakers took up an FLSA amendment in 2007 to raise the minimum wage in three steps, the tipped wage was again left off the table. Inflation has also eroded the purchasing power of both wage floors, but the fundamental cause behind the decline of the tipped wage has been the long decades of inaction. Today, its real value is at its lowest level since it was established in 1966. Over time, the ratio between the two wages fell from 50% in 1966 to just 29% in 2013, which means the tipped wage has fallen more than 20 percentage-points against the federal minimum wage. The subsidy afforded to employers ($5.12) is now more than twice the base wage they actually pay their workers. In short, most of the money these workers receive is from customer tips, not from their employer. In the absence of federal action, states have stepped in to institute a mix of wage floors of their own. Under various state policies, we have a system where wait staff in Texas are paid an hourly wage as low as $2.13, while a server at the same restaurant chain in Washington State earns a base wage of at least $9.19 an hour. This example reflects a range of both wage tiers across the country, which changes the tip credit amount that employers are allowed to claim. This is because the joint wage system depends on both the regular and the tipped minimum wages. The first determining factor is whether a state follows the federal regular minimum wage of $7.25 or whether it has adopted a higher state minimum. The second factor is which tip credit provision the state falls into: full, partial, or no. A full-tip credit state takes advantage of the maximum allowable tip credit, enabling payment of the lowest sub-minimum wage ($2.13 per hour, the federal tipped minimum wage). A partial-tip credit state has a sub-minimum wage that is above $2.13 but below the binding minimum wage for that state. Finally, states that require employers to pay tipped workers the binding regular minimum wage are referred to as no-tip credit states; at a minimum, tipped workers are paid the same as non-tipped workers. The figure below shows the three basic tip credit categories. 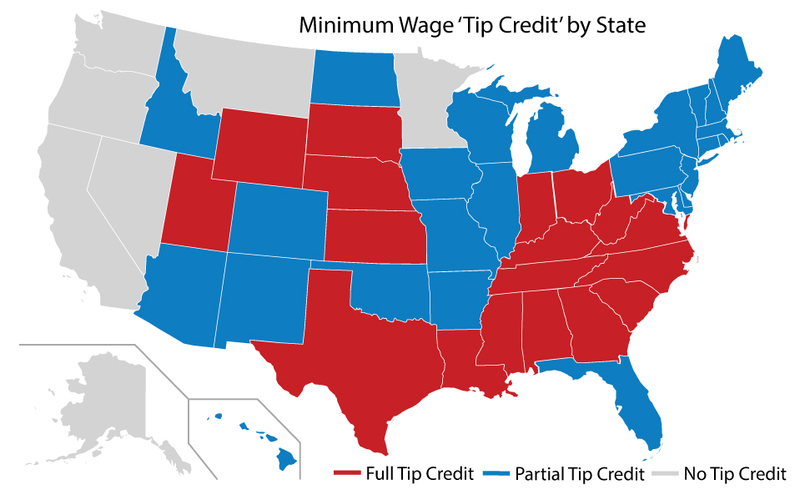 The red states allow the full-tip credit and a sub-wage of $2.13. The blue states have tipped wages above $2.13 but below the binding regular minimum—the tip credit amount varies in these states. Those colored in grey do not allow the sub-minimum wage; in those cases, that has been the policy for a long time. These six general scenarios — determined by the three tip credit provisions and the binding state or federal regular minimum wage — change whenever states adopt a higher minimum wage or the federal minimum wage is raised. For instance, states may have a binding state minimum wage prior to a federal increase but then revert to the new federally binding minimum when the latter is increased. A few examples highlight the vast differences in policies across the United States. Texas follows the federal policy for both minimum wage tiers, so the allowable tip credit provision afforded to employers is $5.12, while the base wage for tipped workers is $2.13. Minnesota follows the federal policy for its regular minimum wage but it does not allow for a tip credit. New Mexico has a regular minimum wage above the federal level ($7.50) but follows the federal policy for the tipped wage, so its tip credit is $5.37. Interestingly, Massachusetts has a regular minimum wage of $8.00 and a tipped wage of $2.63, also allowing a tip credit of $5.37. Conversely, Hawaii’s regular minimum wage is $7.25, but its tipped wage is $7.00, which leaves a tip credit of just $0.25. Not surprisingly, the median wage of wait staff varies by the allowable tip credit provision: $8.75, $9.14 and $10.27 for full-, partial-, and no-tip credit states, respectively. These variations explain why two food servers in different states can earn vastly different wages, even if they work at the same restaurant chain. The variance in wage rates across states also indicates that restaurants can in fact pay higher wages, expand, and be profitable when tipped workers earn a base wage above the federal rate. Otherwise, restaurants would not bother to expand in no-tip credit states. Even in San Francisco, where employers are not allowed a tip credit and the citywide living wage is $10.55, the restaurant industry is booming. The sub-minimum wage is not just an existential concern for millions of workers, but a vital policy issue that has been all but ignored by experts for decades. A common misconception among policy analysts, regardless of their ideology, is that wait staff make “a lot” of money. Earlier this summer, I gave a briefing on the tipped wage in Washington to the staff of the Senate Health, Education, Labor and Pensions Committee. I told them up front to put aside their personal experience of fine dining in D.C. restaurants, suspecting that this crowd often runs up fairly large bills that result in generous tips. I then asked them to think about the servers working in a Denny’s in Ohio, a diner in rural Pennsylvania, or at a truck stop in Wyoming. In these cases, tipped workers in general and wait staff in particular are overwhelmingly women (72%). And contrary to popular belief, they are not all teenagers on their first job: 45% of tipped workers and one in three wait staff is at least 30. 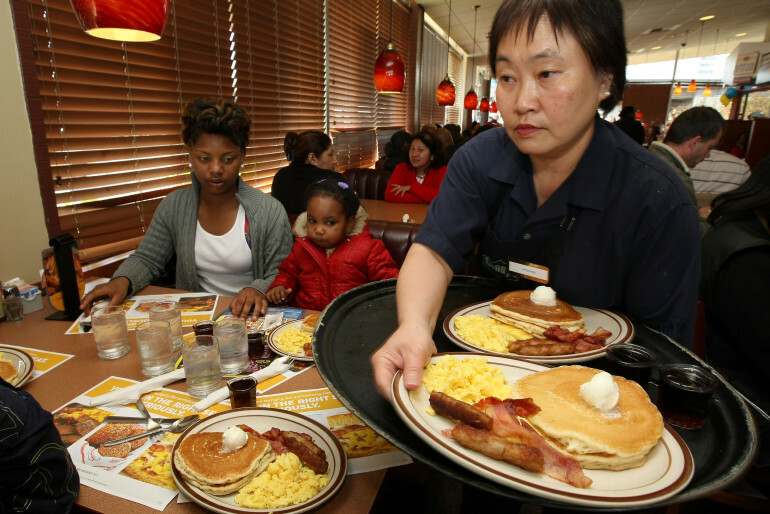 The low wages of tipped workers result in high poverty rates. Among all workers, 6.3% are classified as living below the federal poverty level; that rate varies from 6.0% to 6.7% depending on the three tip credit scenarios. But for wait staff, poverty is far higher, at 16.7% overall. And again, the rates vary greatly by the state tip credit status and decrease as wage rates increase: 19.4%, 16.2% and 13.6%, for full-, partial-, and no-tip credit states, respectively. Another point to underscore is that these jobs are, for the most part, not quality jobs. For instance, they often lack basic benefits like health care or sick leave. Moreover, a worker is left with a base wage that is often non-existent after taxes. And tips may vary greatly from day to day and depend on the shift for which a worker is scheduled. Working a Monday afternoon may be much less lucrative than Friday evening. Most striking – and ironic – is that those who work in the restaurant industry experience a high degree of food insecurity. While about 8.4% of workers need food stamps to make ends meet, the figure is 15.7% for workers in the restaurant industry, and 14.5% for tipped workers. These are economic outcomes that policymakers should keep in mind because the restaurant industry is one of the fastest growing in the country, and it employs large numbers of minimum and sub-minimum wage workers. While private sector employment grew by about 22% since 1990, the restaurant industry grew by over 70%. A hike in both the regular and the sub-minimum wage at the federal level would help a vast class of workers. Otherwise, taxpayers will continue to subsidize the bottom line of employers who skimp on wages and force workers to rely on public support such as Medicaid and food stamps to make ends meet. After my presentation to the Senate staffers, many of them approached me absolutely shocked to learn of this wage system. A policy that few know or care about is a policy that will remain unchanged — in this case, for 22 years and counting. This issue has been off the radar in Washington, D.C., for several decades for many reasons – but an important one is that the tipped wage disproportionally affects low-income women, who do not have a lobby with the clout of the National Restaurant Association. This is not to say that lawmakers have given up. A Democratic bill is circulating that calls for a minimum wage of $10.10 and re-links the sub-minimum wage to the regular minimum wage in several steps, ultimately bringing the former to 70% of the latter. The bill also calls for annual adjusts to account for price increases, which would prohibit the buying power of both minimum-wage tiers from eroding over time. A stronger wage policy would be a first step in addressing two of the biggest problems in our economy – inequality and poverty among the working poor. Of course, with Congress gridlocked on literally everything, it is hard to envision any federal legislation passing soon. In the meantime, economists can provide empirical research to help inform and educate the policy community as well as the broader public. Research from economists can help complement the work of groups such as the Restaurant Opportunities Centers, which are operating nationwide, and the National Employment Law Project in New York City; both have been bringing attention to this issue in recent years. Labor economists, in particular, can play a vital role in answering questions like: How high can wages go up without adversely affecting employment for these workers? What has the impact of the variance in state wage policies been on health, upward mobility, and other related factors? What are the outcomes of state policies that have countered the inflation-adjusted decline in this wage tier? Just to give one example, my colleagues and I have several research projects in the works to further look at both the regular and the sub-minimum wages. One is collecting data to analyze the price effects of San Jose’s citywide wage increase in March 2013, from California’s $8.00 minimum to $10.00, and how it affects restaurant menu prices. To date, most research finds it produces only small price increases. We are also investigating the effects of varying tipped wages on the poverty rates among these workers. But far more research needs to be done. The more that we economists can find out, the better we can equip policymakers with analysis to support their efforts. In turn, this can promote a national debate on an issue that has been under the radar for too long – despite the fact that millions of Americans have long been affected, and will continue to be in the future. It would have been more interesting if it included an analysis of what restaurants in each state typically pay their workers. Its most likely much higher than the allowed minimum, otherwise the restaurants would go out of business because they would lose their employers to other jobs. Minimum wage laws don’t really help – there is no magical wand that repeals laws of supply and demand. Business people/investors take the going wage into consideration when deciding to go into business – if that going wage is set artificially high that investor or business person would most likely invest elsewhere – and no job would be created at all. Minimum wage laws set higher than the natural wage destroys jobs, minimum wage laws set low rarely have any effect due to competition for labor. High minimum wage laws hurt mostly the unskilled worker whose only competitive advantage may be their willingness to work for a lower wage in exchange for a chance to prove themselves or to develop a skill on the job. What is the ‘natural wage’ exactly? “Its most likely much higher than the allowed minimum…” Except that it is not.